« Homepage / Products I Like / "30-Day Mom Time Challenge With EA Sports Active"
I got this new neat Wii game called EA Sports Active which happens to be the latest craze in town and started with the 30-day challenge yesterday. I was so excited and couldn’t wait to start. From what I’ve been reading from other hot moms who started with the challenge ahead of me, the workouts are really good and made them sore. So the EA Sports Active package comes with the DVD game, a resistance band, and a leg strap. For day 1, I chose to do the medium intensity workout. I like the fact that I have my own virtual personal trainer that gives me feedback rightaway if I’m doing the moves correctly or not. I also love how the workout was broken down into different categories. I got to do cardio by running on a track, and let me tell you, I got tired running because it tells me right away if I’m too slow. And because I was trying to impress my kids who were watching me the whole time, I tried showing them I can run! 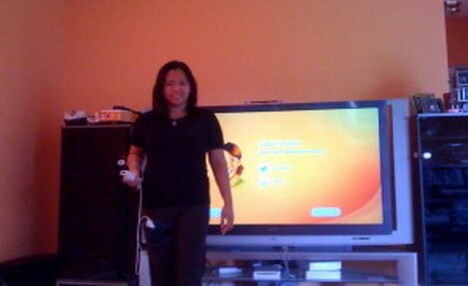 I also like the upper body exercises using the resistance band. I didn’t use the resistance band that came with it, because I already have two (a green and red) resistance bands, so I just used my green one. My arms are sore today but it’s a happy soreness. I got to do lunges also, and the boxing and kickboxing moves using my balance board are sooo fun as well as the inline skating! My day 1 workout was about 23 minutes long. Not bad for my mom time! I just wish there were some abs exercises included with it, but who knows, since this game adjusts with my performance, maybe I’ll have abs exercises on the coming workout days. Day 2: Since I survived the medium intensity workout, I am now brave enough to try the high intensity workout today. It’s basically more repetitions of upper and lower body exercises. New moves were introduced and more lunges! I’m already feeling my legs getting sore. Didn’t do any boxing moves, but I got to play tennis on my balance board. It’s exciting to see that the moves were different from yesterday, and because I increased the intensity, I have expected to get more challenging moves… and I did. Workout this time lasted about 35 minutes. Also used the online journal, which helps me not only get motivated to workout, but also keeps track of my overall lifestyle including my eating habits as well as how physically active I am. So there goes my first two days. Doing the 30-day challenge with the EA Sports Active is not like playing a game, but is really working out with exercises tailored to my fitness level and is designed to achieve my fitness goals. As I get stronger over time, the program adapts to keep me motivated and challenged. I am definitely looking forward to a fitter, healthier, and hotter me in the next 30 days! Thanks to Kathryn Peck of EA Sports Active for the chance to review this awesome game. Will be posting developments from time to time. Join me! 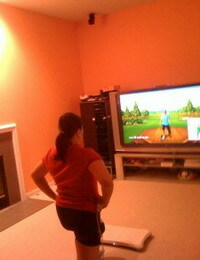 Here you can write a comment to the post "30-Day Mom Time Challenge With EA Sports Active"